For some time now I’ve been eyeing a way to get myself a light, handy lever gun chambered in the .45 Colt, as a companion piece for my .45 Colt sixguns. I’ve thought about refurbishing an original Winchester 1892, but I wouldn’t want to alter a collectible and the metallurgy in older guns might make it unwise to run my favored heavy .45 Colt loads through the finished piece. The company that calls itself Winchester nowadays has reintroduced the 1892, but it has a damnable sliding tang safety that ruins the original look; ditto for the Rossi/Braztech version and its idiotic pivot safety marring the top of the bolt. A gun with an external hammer shouldn’t need an additional safety. But I think I may have found an answer. 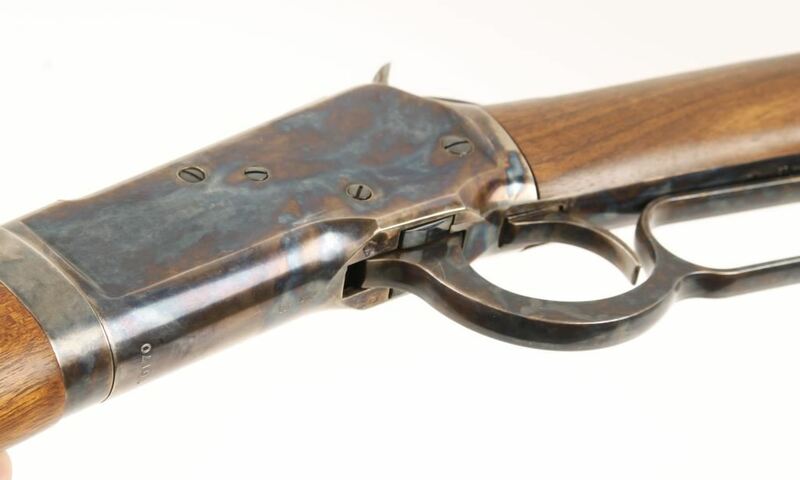 For decades, the 1892 Winchester was the rifle of Silver Screen cowboys, and none was more recognizable than the Duke’s large loop lever-action 1892 carbine. As a mainstay in film after film, this rifle showed true grit, providing some of film’s most exciting action sequences. Mind you, that’s not why I want the gun; I want it because it’s a light, handy carbine with enough punch to settle a typical Colorado black bear or an overly aggressive mountain cat. This is a 6.6 pound piece, light enough to easily carry in one hand. I like the big lever loop, not because John Wayne favored one (although I’d be lying if I said that wasn’t a factor) but because I have big hands and am frequently out and about in cold weather. Big finger levers are easier to handle with gloved hands. This might just be the perfect off-season woods-bumming rifle.